Thank you to the hundreds of people who joined us on July 22, 2013 as we Reconnected the Penobscot River to the Sea! 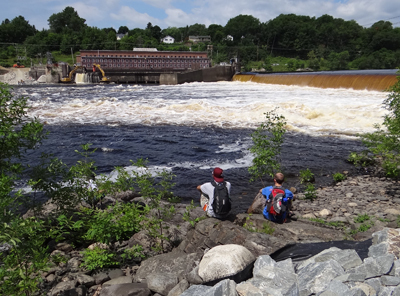 This event reopened the Penobscot River to the sea so that Atlantic salmon, sturgeon, river herring, American shad, and other species of sea-run fish can swim freely all the way to Old Town for the first time in nearly 200 years! Breaching the Veazie Dam marked a monumental step in the Penobscot River Restoration Project, which seeks to restore self-sustaining populations of sea-run fish to the Penobscot River watershed by opening migration paths between the ocean and upstream habitat critical to rebuilding fish populations. Reconnecting the river to the sea will revitalize culture, recreation, ecological health and economic opportunities for the region and Maine. For a list of Penobscot River Restoration Trust partners, visit www.penobscotriver.org.